Performances through April 20, 2016. Philoctetes' tragic story of a marooned soldier resonated with audiences in Brooklyn. 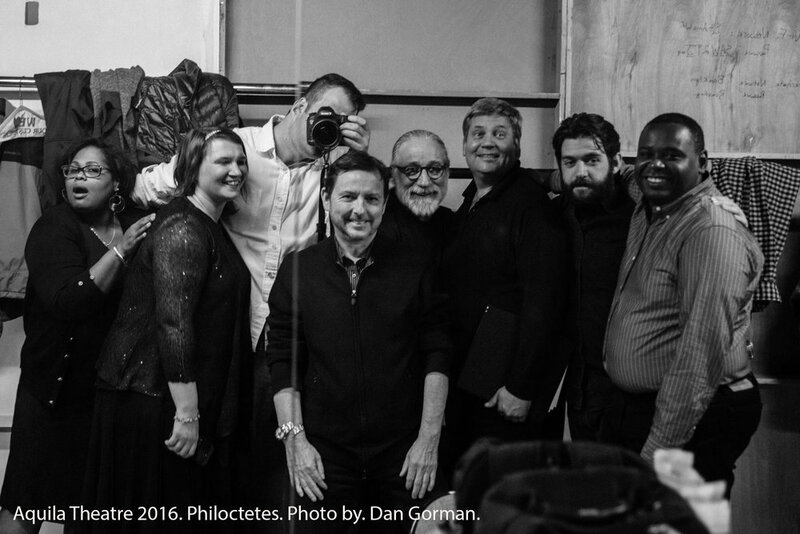 NY Theatre Guide declared Philoctetes "compelling and authentic." Read their review! Stage Buddy said Philoctetes "hits the point home." Read their review! 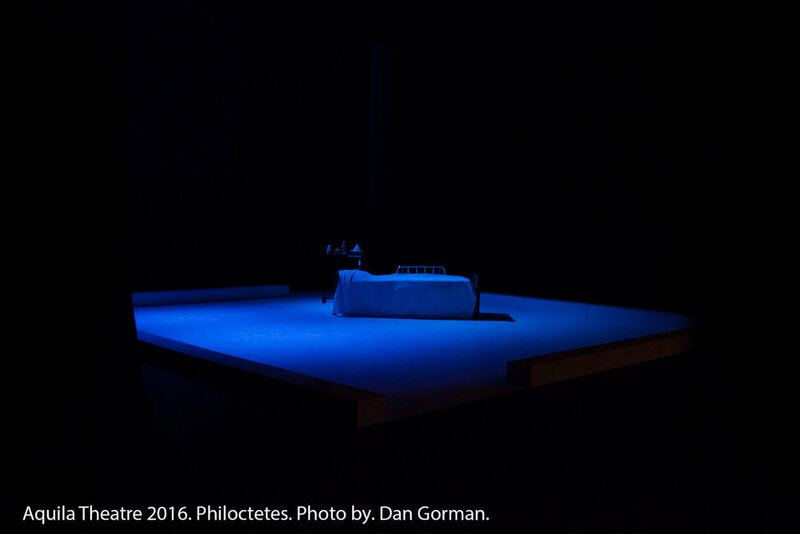 Theater Pizzazz finds "layers of meaning" in Philoctetes. Read their review! Richard was born in Jacksonville, Florida. His father born in New York City, a career Marine; his mother born in Roanoke, Va. of Scottish and Cherokee Indian descent and his Father is of Spanish, Portuguese and Puerto Rican descent. He spent the first 18 years of his life as a Marine Corps Dependent. He spent his days with the nuns in parochial school and his nights and weekends with the Corps. He graduated from Mission Viejo High School in 1969 and attended Occidental College 1969-70. Richard joined the army in 1970. He served 3 years with a tour of duty in Vietnam. After the Army he moved to Los Angeles to begin his acting career. He studied at the Film Actors Workshop at the Warner Bros. Studios in Burbank. His first appearance on TV was the "The Tonight Show" as a Mighty Carson Art Player in 1979. Richard also studied at the Herbert Berghof Studios, New York and the Actors Studio under Eli Wallach in New York. In 1980 he and 7 Vietnam veteran actors created the play "Tracers", which was the catalysis of his career. Since "Tracers" he has been blessed to work on some great projects, the "War of the Worlds" television series and "Predator" being the most acclaimed. Film roles include "Cease Fire", "Witness" and "Night Eyes II" and the documentary, "Dear America: Letters Home from Vietnam." His television roles include guest starring in "Star Trek: Voyager", "Walker, Texas Ranger", "F.B.I. The Untold Stories", "LA Law", "Babylon 5", "MacGyver", "Trials of Rosie O'Neill", "Miami Vice", "Hill St. Blues", "St. Elsewhere", "Eight Is Enough". He was a series regular in "War of the Worlds" and co-starred in "Dallas". He has appeared in the TV movies, "Weapons of Mass Distraction", "LA Takedown", "To Heal a Nation", "Penalty Phase", "Fire On the Mountain", the mini-series "Ari- The Life of Aristotle Onassis" and "The Gambler III". As well as film and television Richard has achieved accolades in live theatre. In 1980 "Tracers" received the Los Angeles Drama Critics Circle Award for Best Ensemble, 1983 Drama-Logue Award for Best Performance in "Vietnam Trilogy" and in 1985 the New York Theatre World Award for Outstanding New Talent in "Tracers". Other appearances include the "Police Officers Wives", "Santos & Santos" and "Pendleton Blanket" and "The Great Divide". Ed has had the good fortune to work at American Repertory Theater, Ivoryton Playhouse, Berkshire Playwrights Lab, and the American Studio at the Moscow Art Theatre. His TV credits include "House of Cards" and "Alpha House". He is a Marine and Iraq War Veteran. He holds an MFA in Acting from American Repertory Theater/Moscow Art Theatre School Institute for Advanced Theatre Training at Harvard University. John M. Meyer is an artist studying at the University of Texas at Austin. His work as a playwright-performer has been featured in the Austin Chronicle, The Austin American-Statesman, KUT radio, and the BBC online. His stage-play "American Volunteers" won the 2010 Mitchell Award at the University of Texas, and subsequently made the long-list for the Dylan Thomas Prize in the United Kingdom. Much of John's work draws on his experiences as an Airborne Ranger. He served in both Iraq and Afghanistan. In recent years, Actor/Writer/Veteran Brian Delate, has combined his experience as a decorated non-commissioned officer of the Vietnam War with his varied career in theatre and film. Philoctetesfollows Brian's work in Aquila Theatre's production of Herakles, which was successfully presented both in Greece and at the Brooklyn Academy of Music. He also participated in Aquila's YouStories.com, and with the educational program of Ancient Greeks/Modern Lives connecting the Greek classics with current veteran and war themes. Brian continues to present his original play, Memorial Day, directed by Dan Bonnell and developed at The Actors Studio under the wise guidance of Ellen Burstyn. He wrote and performed Memorial Day throughout the country as well having the extraordinary opportunity to perform it in front of the former enemy at The National Youth Theatre in Hanoi. Brian also wrote and directed the successful, life-affirming indie feature Soldier’s Heart, which won the “Best Narrative Feature Award” at The G.I. Film Festival. Along with Richard Chaves, Brian performed in the OBIE Award winning Tracers at both the Public Theatre and at the Royal Court in London. At present, he and co-writer Eric Pederson are developing their war-drama screenplay Dante's Obsession for a major feature film production. Brian can be seen as the wheelchair bound Ron Wesson in the second season of HBO's The Comeback with Lisa Kudrow, and in independent feature productions of American Falls and Rerun. He appears in the documentary film, Wild Salome, starring and directed by Al Pacino, which follows the process of the Los Angeles production of Oscar Wilde’s play Salome, which originated at St. Ann’s Warehouse before it went to Broadway, with the stage productions directed by Estelle Parsons. Other films include Nice Guy Johnny, The Brave One, Buffalo Soldiers, The Truman Show, The Shawshank Redemption, Sudden Death, and many others. Television roles include recurring appearances on most of the New York based shows. Brian has appeared in numerous productions from the Public Theater and Central Park to Broadway and regional theatres. He is a life-time member of The Actors Studio, where he also serves on the Board of Directors. Brian dedicates this work to his daughter Tirsa Avalon Delate, who will graduate from Bryn Mawr College in May. Michael is a Veteran of the United States Marine Corps, serving eight years of active duty and two years in the reserves, attaining the rank of Staff Sergeant (SSgt). He is a linguist, fluent in four languages, conversant in an additional 9 languages, trained and certified as an all-source analyst and reporter, and rifleman coach. Michael has recently been seen as Georg in a production of “Spring Awakening,” and in three supporting roles in “Deployed,” a new off-Broadway Musical. Michael has a background in music, playing eight instruments. Caleb’s recent credits include the Amazon series Red Oaks, Odysseus in A Female Philoctetes performed in London and Athens with Aquila Theatre Company, and as a stuntman on Person of Interest. He trains at Anthony Meindl acting studio with Anthony and his studio master teachers in New York. Caleb was born in Seoul, South Korea and grew up overseas, learning German and playing ice hockey across Europe. After attending a military college he joined the Marines, deployed to Iraq, and was also the director of the Marine Corps Shooting Team. Following 6 years on active duty with the Marines, he moved to New York and began acting and performing as a stuntman. Philip pursued the art of photography since high school. His skills progressed while working for the Department of Defense with satellite imagery to map the moon followed by photo processing for Military Intelligence in the Vietnam War. Upon return to civilian life he enrolled in the Fashion Institute of Technology (FIT), SUNY, graduated with an AAS in Fashion Photography and a BA in Photography from SUNY Empire State College. Philip earned an MA from NYU in Higher Education Administration and Counseling and postgraduate courses in Fine Art and Photography at Hunter College, CUNY. After 40 years as a Professor/Counselor in Student Life at FIT, where he taught leadership and human relations skills, and managed extracurricular educational programs, he retired. In addition, Philip has been a Team Building consultant in profit and non-profit organizations. Philip now devotes much of his time to photography and writing. Recent exhibits include the Ellenville, NY, Library and Museum; memoirs of his military experiences have been published in anthologies as well as an on-line journal. One story was recently converted into a short theatrical production at The Wild Project. Maurice Decaul, Warrior Chorus Facilitator, is a former Marine, poet, essayist, and playwright, whose writing has been featured in the New York Times, The Daily Beast, Sierra Magazine, Epiphany, Callaloo, Narrative, The Common and others. His poems have been translated into French and Arabic and his theatre pieces have been produced at New York City’s Harlem Stage, Poetic License Festival in New York City, Washington DC’s Atlas INTERSECTIONS FESTIVAL in 2013 and 2014, l’Odéon-Théâtre de l'Europe in Paris, The Paris Banlieues Bleues Festival, The Middelhein Jazz Festival in Antwerp, The Avignon Theatre Festival in France and Détours de Babel, The Grenoble Festival, Grenoble France, Arizona State University Gammage Memorial Auditorium, The Metropolitan Museum of Art in New York City, The David Rubenstein Atrium at Lincoln Center and the Park Avenue Armory in NYC. Forthcoming productions include The Mary L Welch Theatre at Lycoming College in Pennsylvania The Kimmel Center in Philadelphia, Pennsylvania and Brown University. Maurice is Theatre Communications Group first artist in residence. His album, Holding it Down, a collaboration withh Vijay Iyer and Mike Ladd was The LA Times Jazz Album of the year in 2013. Maurice, a Callaloo and Cave Canem Fellow, is a graduate of Columbia University [BA], New York University [MFA] and he began his MFA in playwriting at Brown in fall of 2015. Desiree Sanchez, Director, has directed this season’s production of Romeo & Juliet and The Adventures of Sherlock Holmes and the past productions of The Tempest and Wuthering Heights for the 2014/2015 season, and the past productions of Twelfth Night and Fahrenheit 451 for the 2013/2014 season, A Female Philoctetes at BAM Fisher’s Hillman Studio, The Taming of the Shrew and Cyrano de Bergerac for the 2012/13 season, Herakles at BAM in March 2012 and the Festival of the Aegean in Syros, Greece and the Michael Cacoyannis Foundation in Athens in July, 2012, Macbeth and The Importance of Being Earnest for the 2011/12 season, and Six Characters in Search of an Author for the 2010/11 season; created movement for Aquila’s A Very Naughty Greek Play (Aristophanes’ Wasps), Catch-22, Julius Caesar, The Iliad: Book One and The Comedy of Errors; performed in The Iliad: Book One at The Festival of the Aegean in Syros, Greece; and was the lead teaching artist for Aquila’s Shakespeare Leaders program in Harlem. Desiree had a twenty-year dancing career including working as a principal dancer for the Metropolitan Opera Ballet where she worked under the direction of numerous directors and choreographers that included Francesca Zambello, Mark Lamos, Doug Varone, John Dexter, Franco Zeffirelli, Julie Taymor, and Andrei Konchalovsky. Other companies and choreographers she has worked with include the Boston Ballet, Neo Labos Dancetheatre, Donald Bryd/The Group, Sean Curran, Gelsey Kirkland, Bill T. Jones, Heidy Latsky, Eun Me Ahn in Korea, and Robert La Fosse. She has also collaborated with the Winnipeg Contemporary Dance Company of Canada and the Delfos Danza Compania of Mexico. She performed for the Papermill Playhouse as a featured dancer in the musicals, Carousel and The King and I. She has also taught at Long Island University, as a visiting associate professor of dance, Elliot Feld’s Ballet Tech and has a Certificate of Movement Therapy from The New School and is a proud graduate of Walnut Hill School of the Arts. Peter Meineck, Founder/Lighting Designer. He founded Aquila Theatre in 1991 and worked extensively in theater in London, New York and throughout Europe in various capacities that ranged from theater electrician, rigger, lighting designer, director and producer. He was trained by Martin Godfrey, technical manager of the Bloomsbury and Royal National Theatre in London. Theaters he worked at include: the Almeida, the National Theatre, the Phoenix, the Aldwych, the Fortune and several other West End theaters, the Bloomsbury and the Shaw to name just a few, working under the likes of Ace McCarron, David Hersey, Pat Collins and Mark Henderson. With Aquila, he has produced and/or directed more than 50 professional productions of classic drama and has lit many of Aquila's shows. Favorites include: Iliad (1999), Cyrano (2001), Catch-22 (2009), Macbeth (2011), Fahrenheit 451 (2013). He is currently Professor of Classics at New York University where he specializes in ancient performance and the application of cognitive science to the study of the ancient world. He is a graduate of University College London (BA hons. Ancient World Studies) and the University of Nottingham (PhD Classics) and former Royal Marine Reservist. Peter continues to serve as a Lieutenant Firefighter and EMT in Westchester, NY.